Magnolias (Magnolia spp.) are a diverse group of trees known for their large, fragrant blossoms. Of the many species only a few are commonly used as landscaping plants, but they are among the most popular species for creating a focal point in the landscape. 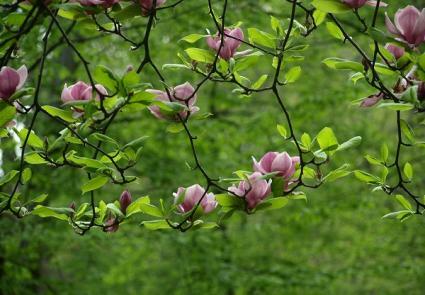 Magnolias vary in height from 10 foot patio trees to towering 80 foot canopy trees. There are three main types used in landscaping: two Asian species and one North American species. All have large dark green leaves with a somewhat tropical appearance that grow anywhere from four to 10 inches in length. They also all share an attractive cone-like seed structure that ripens to reveal bright red seeds in fall. All the following varieties are commonly available at nurseries throughout the United States and are best transplanted in fall. 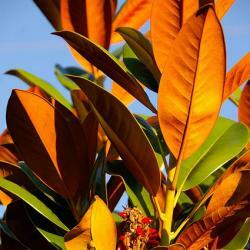 Regular irrigation is important for the growth of all magnolia trees. These are the smaller of the magnolias used in landscaping and are known for their early spring bloom that occurs even before the leaves emerge. They are ideal as patio trees and can even be grown in large planters. Another option is to use them as a focal point amid a bed of low-growing bulbs and perennials. 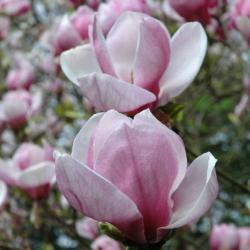 Asian magnolias need full sun and rich, well-drained soil to grow and bloom well. They are virtually immune to pests and disease problems though powdery mildew may occasionally infect the plants. It's a good idea to rake the leaves each fall to help keep the disease under control. 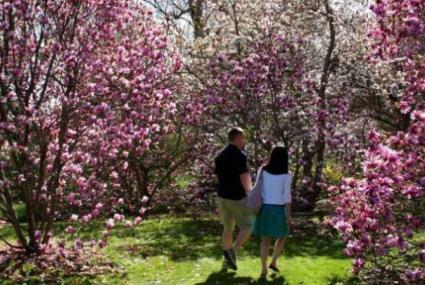 Asian magnolias bloom so early that late winter frosts sometime damage the blossoms. Thus it's helpful to plant them in a protected location though there are also late-blooming cultivars that are less vulnerable to this problem. 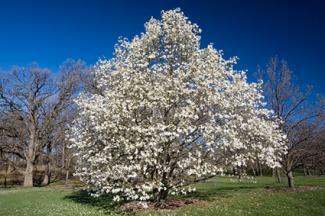 Star magnolia (Magnolia stellata) grow slowly up to 15 or 20 feet tall and 10 or 15 feet wide. The frilly white flowers can be up to five inches in diameter depending on the cultivar. It's hardy in USDA zones 4 to 8. 'Rosea' is a pink-flowering form. 'Waterlily' is a late bloomer with five-inch pure white blossoms. Saucer magnolia (Magnolia x soulangiana) is a popular hybrid magnolia with enormous blossoms up to 10 inches in diameter. The flowers are white with blushes of pink and purple and open into a broad saucer-like shape. It grows very slowly up to 30 feet tall and is hardy in USDA zones 4 to 9. 'Lennei' blooms later and has larger leaves and flowers than most other cultivars. 'San Jose' is a variety with pinkish-purple blossoms. Several species of magnolia are native to the eastern United States though the Southern magnolia (Magnolia grandiflora) is by far the most commonly planted. 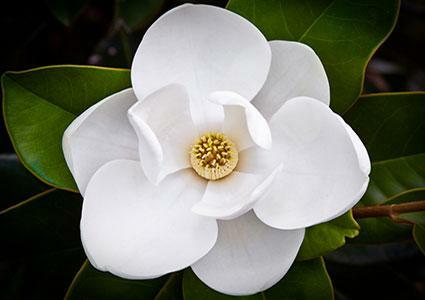 Southern magnolias are stately evergreen trees with enormous white blossoms that are equal in beauty to their Asian counterparts though the flowers appear several months later. They have the unusual ability to grow in both sun and shade and are adapted to most soil types other than constantly wet places. They are very resilient, easy to grow trees, though it helps to enrich the soil with compost to get new plantings off to a good start. They are usually planted as shade trees though the dwarf forms are useful as a tall hedge. 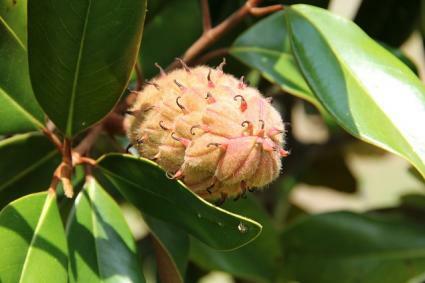 Pests and disease are rarely an issue with southern magnolia, but it is notoriously difficult to grow other plants underneath them. Between heavy shade, thick leaf drop and an aggressive root system, most plants struggle to survive in their midst. They are usually grown with a mulch of their own leaves around the base and little else. These varieties are hardy in USDA zones 7 to 9. 'Claudia Wannamaker' grows to about 50 feet tall and has leaves with leathery brown undersides. 'Green Giant' grows to 60 feet tall with an upright pyramidal form. 'Teddy Bear' grows to 20 feet tall with an upright shape and has leaves with reddish brown undersides. Magnolias offer a spectrum of options for the landscape from petit trees that are like a bed of spring bulbs on a tree to majestic forest species. Though they are among the royalty of flowering trees, they need little pampering, flowering year after year with little to no care.